In world history there is very few moments when you know for certain the universe changed forever. More times than not its only when you back at key moments you realize that there is more to "the moment" than we thought. In the world of entertainment it’s easier to know where things changed- you can see the moment when something becomes the new norm or the new big thing because you see it's effect by being copied and referenced a short time later. Take for example the animated GHOST IN THE SHELL. Released in 1995 it was a film that shattered how the world viewed reality. It was a film that altered animation and every other that came after it. GHOST begat THE MATRIX and THE MATRIX changed everything. 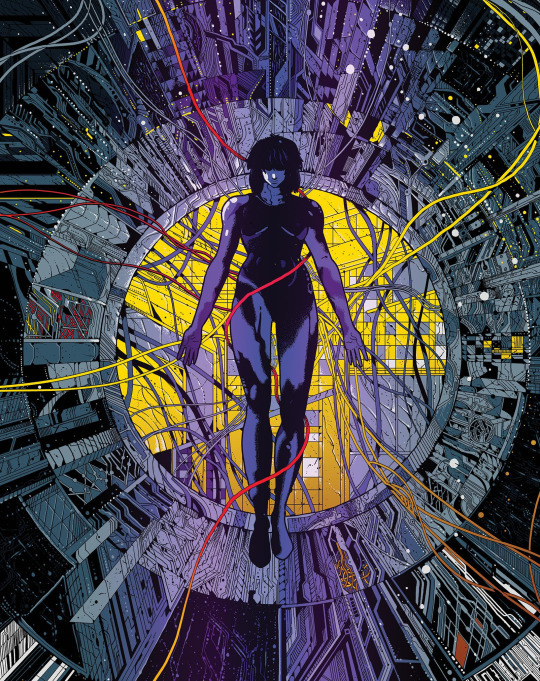 GHOST IN THE SHELL is the story of Major Motoko Kusanagi the leader of Section 9 an elite team which are tracking a hacker/killer known as The Puppet Master. The Puppet Master seems to be hacking bodies. As things progress it becomes clear that his plans seem to be tied to a super secret project. Of course since the Major is cybernetic there is a danger of him taking over her body. The thing is that as influential as the film is most people forget that the ideas in the film come from Masamune Shirow who wrote the manga that the film was based. However while Shirow gave the form to the story of GHOST IN THE SHELL Mamoru Oshii gave the form life. In Oshii the film found not only the perfect director to bring the story to life, but also a director who would repeatedly revisit the themes and ideas found in the film over and over again (especially in Oshii's live action films like AVALON). For me it is impossible to really discuss GHOST IN THE SHELL. I’ve seen it any number of times since its first release and it’s become like many films that are good friends, the film is what it is, flaws and all. While I can see flaws and things I’d do differently, especially as time has moved on, the film remains this thing that is kind of like part of me and something I can't really explain. I've also discussed the film so much over the last 22 years I really have nothing new or clever to say, because either I had that conversation or because some like Brian Ruh, who wrote the book on Oshii already said it. Additionally since the film spawned cinema and television sequels and reinvention any questions concerning the plot have been handled and refined by later iterations of the story. In discussing the recent live action film with Scarlett Johansson with Randi we discussed how the original was kind of helped by the later stories to the point that in a weird way all the stories are now one - like the various cinematic universes of today..
That said the film is still a kick in the pants. Its a film that moves you and gets you to think even if you've seen it several dozen times. If you've never seen it you have to. The film is a key film in not only cinema history but science fiction and world history. Its a film any one who wants to know how we got here must see. The film release tomorrow in a beautiful steelbook edition from Anchor Bay and it's got everything you could want concerning the film- and the packaging is pretty damn cool too.